Everyone one of these people is drunk. Promise. Photo courtesy of Filament. Downtown Las Vegas is the place to go for cheap drinking, as you’ll see throughout this list. And Fremont Street pretty much runs the show when it comes to drinking in general. If they ever make something like a water park but with booze, it’ll be Fremont Street. We’ll name drop a bunch of bars there throughout this piece, but one in particular deserves to be called out, if for no other reason than its $3 Heinekens. Filament at the Fremont is a cool casino bar just inside and off of Fremont Street Experience. They have a nice selection of speciality cocktails, including a fantastic piña colada. And did we mention $3 Heinekens? Where else can you get a deal like that in this town? OK, this person is probably actually drunk. Photo courtesy of Beauty Bar. Oh Fremont East. If bars were angels then you’d be heaven. One such angel is Beauty Bar, the clever New York-inspired nightspot that has live music and manicure stations. Because if there’s one thing you want when you’re drunk it’s wet nail polish. In addition to the amazing shows they put on in the back patio area, they also host Nickel F*&$ing Beer Night on Tuesdays. The nights usually devolve into a party of reasonable proportions. And when your favorite indie act is playing, the whole space becomes memorable. 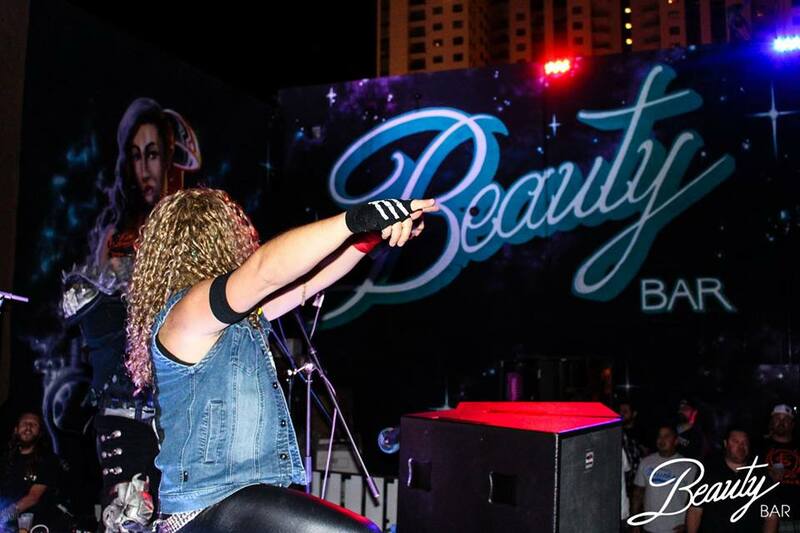 Even if it’s not NFBN you can have an amazing time at Beauty Bar. Just be sure to plan around one of the incredible performers they bring in. That guy had a full-sized head when he walked into the place. 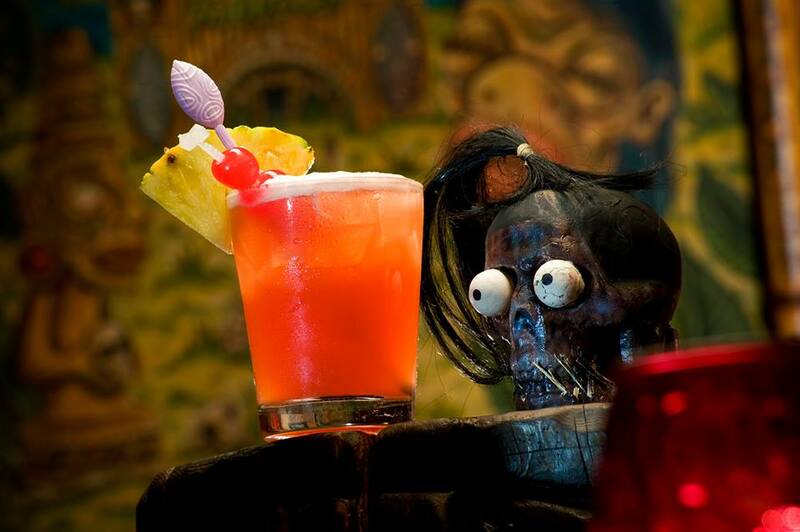 Photo courtesy of Frankie’s Tiki Room. Ask any local to tell you their Frankie’s story and they’ll start off strong before realizing they don’t remember the rest of that night. But they’ll still happily show you the odd tattoo or even odder ex-wife they woke up with the next morning. Frankie’s is just that kind of anything-goes type of joint. If at first glance the prices don’t seem cheap enough for you, trust us when we say that they more than make up for it in the amount of alcohol in each glass. They’ve been known to pour four ounces of alcohol into a single shot glass. We don’t care if that’s physically impossible. Frankie’s laughs at your puritanical notions of fluid mechanics. And you’ll be laughing too once you down a few of these. If the beer is still green be sure to contact someone. It should be back to normal beer color by now. Photo courtesy of Ellis Island. 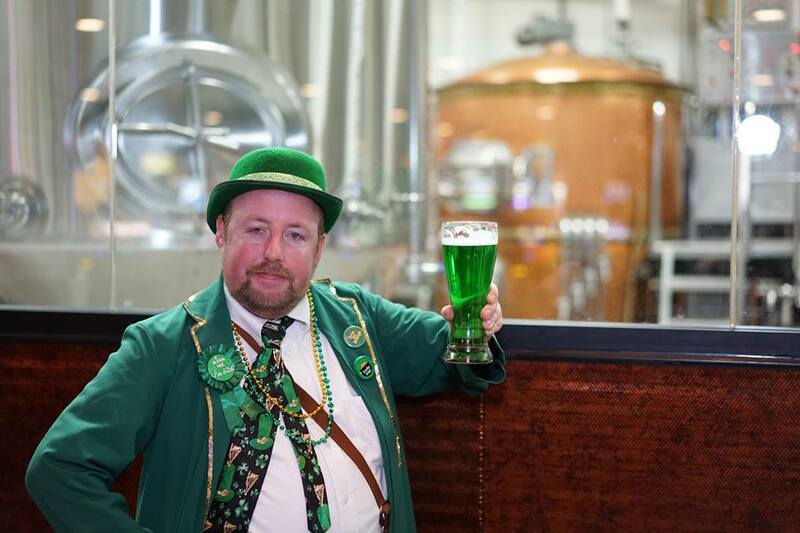 The cool uncle of all Vegas bars, Ellis Island is an off-Strip casino and brewery that keeps locals and tourists coming back. It’s the kind of place where you can hang out with friends all night or pop in for some pre-gaming before going to the club. And if you’re into ‘aoke — that’s karaoke to the un-initiated — then this is totally the place to be. Grab some of their signature brews and work up the nerve to finally bust out that baritone version of “I Will Always Love You.” It’s probably a part of why they keep their prices so reasonable. Get enough liquor in people and they all turn into divas. Either that’s a fish eye lens or that camera is drunk. Photo courtesy of Atomic Liquors. There’s something about being the oldest free-standing bar in Las Vegas that makes you yearn for the days of cheap liquids. But hey, even when gas is $4 a gallon, a bucket of beers is still like $20. Somewhere in there is a comment about the economy but we don’t understand economics enough to find it. What we do understand is amazing beer selections from a bar that knows how to do everything right. Atomic Liquors has lasted this long because it has a fantastic atmosphere, including guest tappings and outdoor space, with prices that can’t be beat. 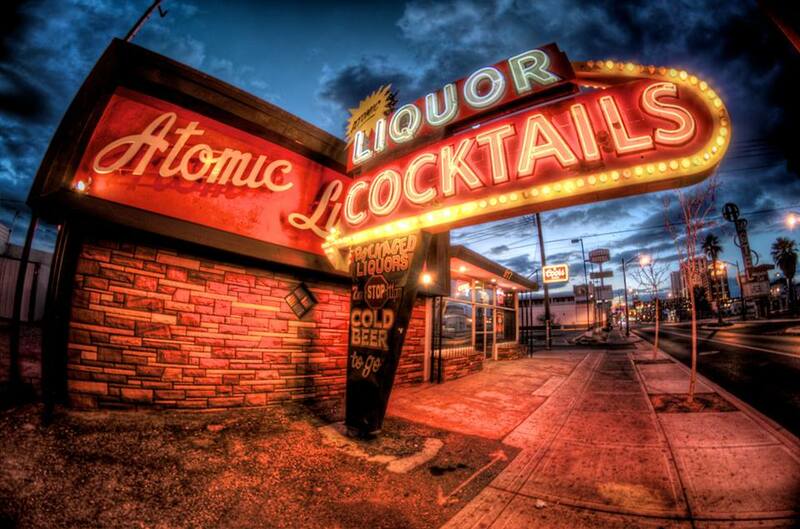 If you’re downtown and want to drink until you pretend to understand how the economy works, Atomic Liquors is a blast. You can afford to buy all of these drinks. Photo courtesy of Stratosphere. Stratosphere is rocking a campaign right now to give locals, and those who don’t want to spend $300 a night for a room, a place to enjoy Vegas right. We full support every little thing about this mentality. 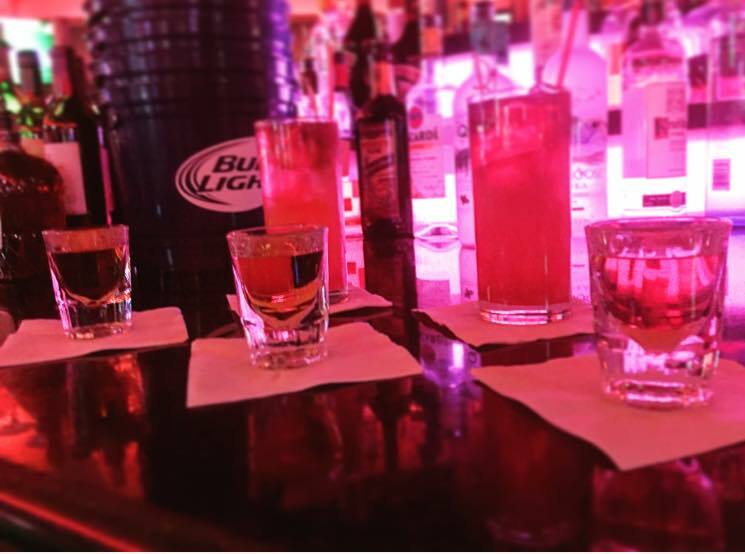 When you get to the casino, be sure to check out any one (all) of their casino-level bars for $3 Jaeger shots 24/7. Why are they giving $3 Jaeger shots 24/7? Because they’re awesome. Why would you even ask that? Once you get a few of those in you, you’ll be more psyched to head up to the tip top of the tower for some thrill rides. Just make sure you get the right amount in you and have some food with them. You don’t wanna make trouble for the people down below if you get sick. This is what it looks like when you’ve out-drinkied everyone else in the bar. Photo courtesy of Backstage Bar and Billiards. Back to Fremont Street, which is something you’ll inevitably say if you spend enough time in Vegas, we find Backstage Bar and Billiards or BBB as we like to lazily type. In addition to cheap drinks and bar games, they also host amazing shows that make the entire experience even more thrilling. As we’re sure you’ve noticed by now, drinking on Fremont Street is kind of an adventure in itself. BBB is one of those places where you can end a fantastic night on a high note with a cheap beer and some good friends. Maybe you can even hustle some pool and get all your money back for the night. Great deals on bloody marys, for anyone who actually likes bloody marys. Photo courtesy of South Point. We’re not going to call out every bar at South Point, mainly because we only have so much time in our lives and we’re pretty sure there’s a bar about every seven feet in that place. If you walk into South Point and you can’t find a drink then you need to call the Winchesters cuz it’s the apocalypse all over again. 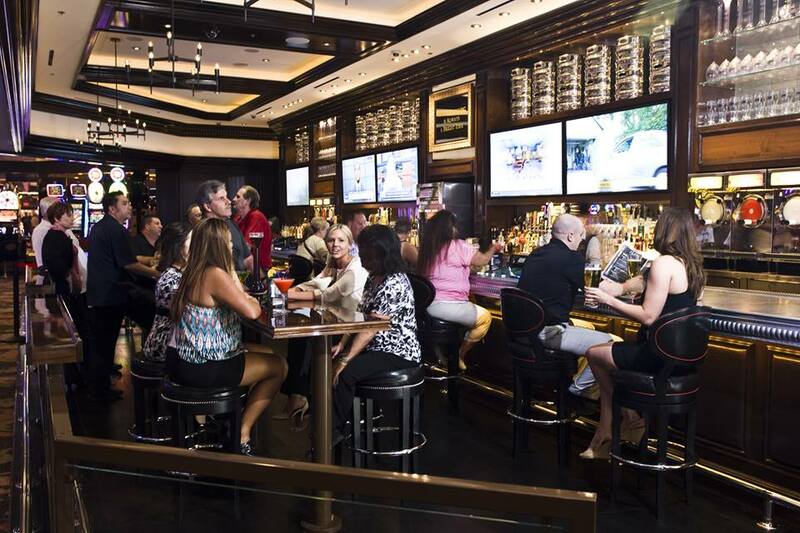 With great restaurants, a showroom and one of our favorite bowling alleys, South Point has plenty of entertainment; and you can get drinkies with it all. 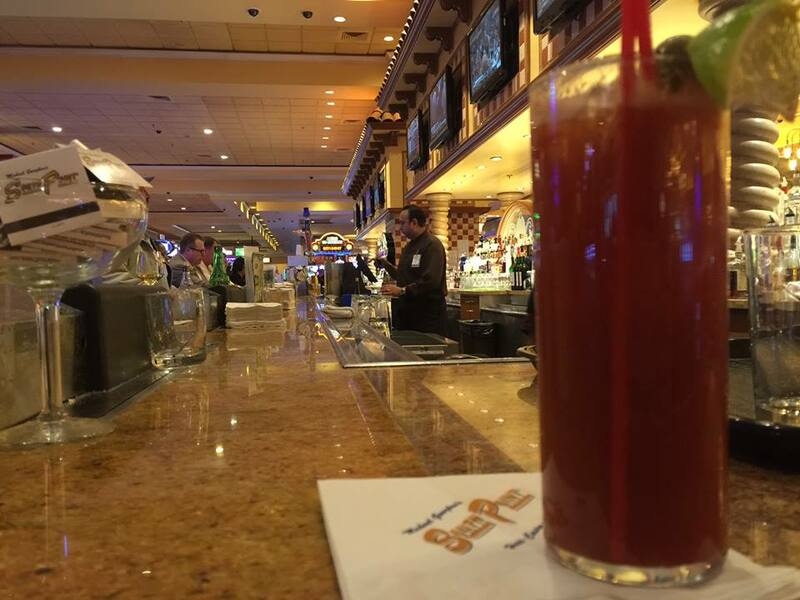 If you’re staying somewhere toward Henderson on the south side of Las Vegas, or just looking to get away from the Las Vegas Strip for a bit, South Point is a classic Vegas hotel/casino that has everything you need — including a truly inspired amount of bars. We’ve had too many drinks to write a decent caption. Photo courtesy of the Garage. We’re not saying gay people are inherently better at partying. But yes, we’re saying that exact thing. 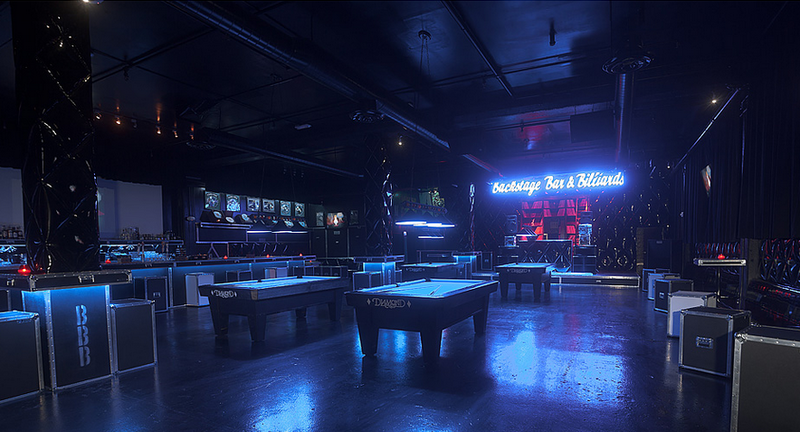 When it comes to gay bars in Las Vegas, you’ve got your pick of fantastic party spots. And each one knows how to give you the goods for a reasonable price. 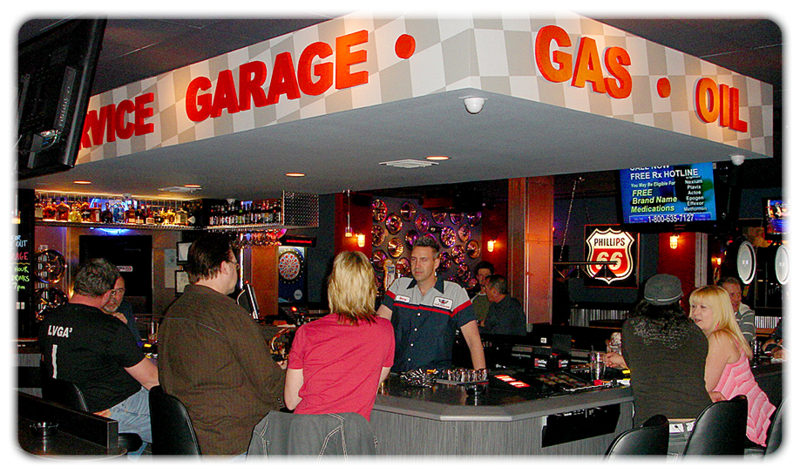 The Garage offers two-for-one specials with custom poker chips as drink tokens. FreeZone has stiff drinks and great deals 24/7. Goodtimes offers the occasional open bar during the day. And Piranha sports BOGO deals often. Just remember to cash in your Garage chips. They’re so cute we sometimes forget to get the free drink and instead just take them home. But on the bright side we haven’t had to buy poker chips in like three years. Yay! 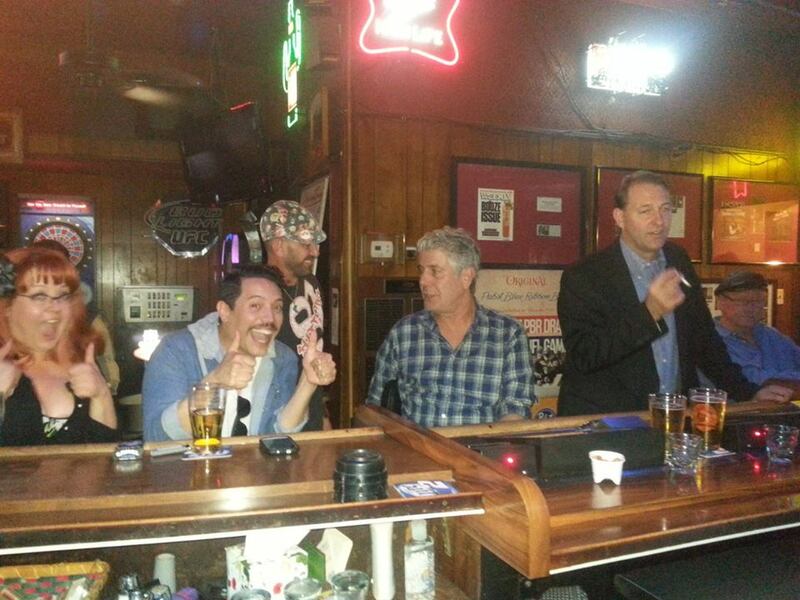 We got to dust off our Anthony Bourdain picture again. Photo courtesy of Huntridge Tavern. Now we’re talking about the Vegas we locals adore. You can go to the Strip. You can love downtown. You can drive all the way to the Grand Canyon if you think you can bum a beer from someone’s cooler. But nothing is going to fill that neighborhood bar void better than Huntridge Tavern. This is where locals and tourists unite under the banner of just plain drinking in a cool bar. If you’re looking for a place to just drink the night away that isn’t dependent on gimmicks, then Huntridge Tavern is the place to be. We could end this on some big joke, but there’s really no need. This is the neighborhood bar you left back home, just a little ways from the Strip. As always, you can find more bars on our Vegas bars page and decide for yourself how much you want to spend when you go out.